It is time to Win A Stash! Welcome to the first of many great events hosted by Kerrific. We are super excited to be part of this event where each month one lucky winner will win a stash of items to help make their life easier, greener, and more fun. This month we are giving away a set of 12 newborn sized diapers and a wet bag in gender neutral colors. These are pocket diapers and each comes with a newborn sized insert. The diapers are designed to fit babies 12 pounds and under. 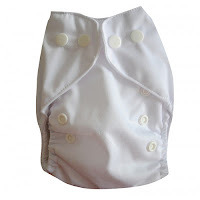 The diapers feature snaps for easy adjusting and a secure fit. There isn't a better way to start your new baby out than with a cloth diaper stash of their very own. Make sure you stay tuned to hear about all the future Win A Stash events hosted by Kerrific.